Arunachal Pradesh congress committee (APCC) called 10 hours Arunachal bandh from 5 AM to 3 PM on Monday as a part of Bharat Bandh against the Arbitrarily increasing of fuel price. Protesters blocked highways in Capital town Itanagar of Arunachal Pradesh . shopkeepers downed shutters in twin capital city Itanagar and Naharlagun during Arunachal Pradesh Bandh on Monday. 02:00 am According to Police so far 70 bandh supporters were taken in to custody only in Itanagar. 11:00 am long distance buses are not plying. passengers are stranded in ISBT . 10:30 am According to Police so far 30 bandh supporters were taken in to custody. 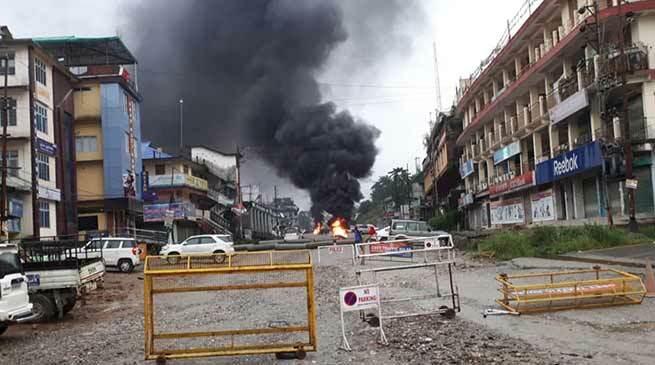 09:30 am The bandh effected in Twin capital city Itanagar and Naharlagun . All commercial establishment, shops and markets were remained closed. Including govt. and privet offices, banks and educational institutions were also seen closed at the time of bandh. 07:30 am Band supporters and members of Mahila Congress protesting before the city petrol pump. All petrol pumps in Itanagar and Naharlagun are remain closed . 05:30 am Shops, schools and other commercial establishments were closed in parts in all over state. Protest must be acted peacefully without creating any harm to the nature. Burning of something like plastic and some other toxic materials won’t give us right. Instead it will cease our beauty and gradually there will be no petrol/diesel left. Precautions must be your first set up of mind. Deal everything without destroying the nature.